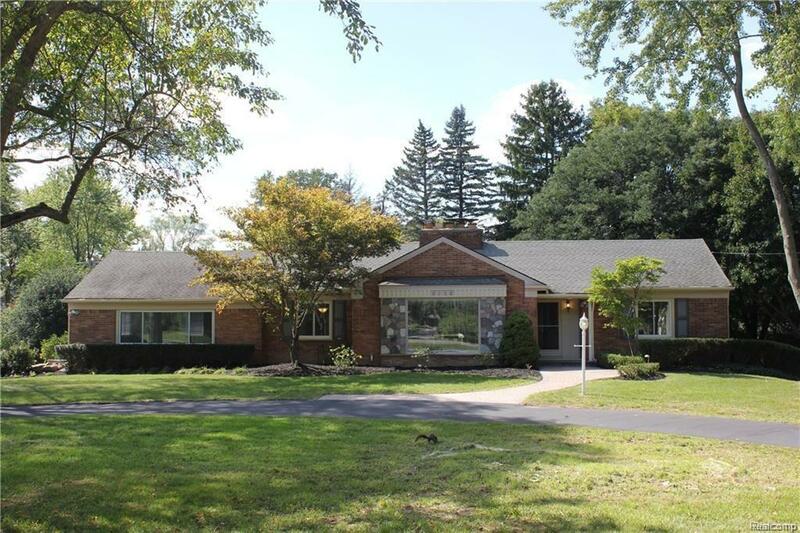 UPDATED RANCH SITUATED ON OVER 1.25 ACRE PARK LIKE SETTING WITH WING LAKE PRIVILEGES & BLOOMFIELD HILLS SCHOOLS! THIS WONDERFUL HOME FEATURES ~3,000 SQFT OF LIVING SPACE INCLUDING THE FINISHED WALKOUT LOWER LEVEL, 3 BEDROOMS & 3 FULL BATHROOMS, UPDATED KITCHEN WITH GRANITE COUNTERS, CUSTOM BACKSPLASH & BRAND NEW STAINLESS APPLIANCES, BRIGHT LIVING ROOM WITH FIREPLACE, DINING ROOM, NEWER FLOORING & CARPETING, BATHROOMS FEATURE CERAMIC FLOORING & GRANITE COUNTERS, NEWER PLUMBING FIXTURES & TOILETS, FINISHED WALK OUT LOWER LEVEL GREAT FOR ENTERTAINING OR ADDITIONAL LIVING SPACE, LARGE STORAGE ROOM & 2 CAR ATTACHED GARAGE. ENORMOUS LANDSCAPED YARD & CIRCULAR DRIVEWAY. ONE YEAR MINIMUM LEASE. MINIMUM CREDIT SCORE OF 700, EMPLOYMENT VERIFICATION AND COPY OF DRIVERS LICENSE. 1.5 MONTH SECURITY DEPOSIT, 1ST MONTHS RENT AND $300 NON-REFUNDABLE CLEANING FEE DUE AT THE TIME OF SIGNING LEASE. I.D.R.B.N.G. Copyright 2019 Realcomp II Ltd. Shareholders. Real estate listings held by brokerages other than The Toth Team - Keller Williams Ann Arbor Market Center are marked with the Realcomp-approved IDX logo and are provided through IDX through Realcomp II Ltd. IDX information is provided exclusively for the consumers' personal, non-commercial use and may not be used for any purpose other than to identify prospective properties consumers may be interested in purchasing. Any use of search facilities of data on the site, other than by a consumer looking to purchase real estate, is prohibited. The accuracy of all information, regardless of source, is not guaranteed or warranted. All information should be independently verified. Data last updated: 2019-04-22T23:56:32.54.